Pumpkins are not just delightfully scary Halloween decorations! Nutritional science discovered new surprises about your Jack O'Lantern! Vegetarians and vegans have long known that pumpkin is a good source of vegetable protein. New England settlers long ago fermented pumpkin to make ale. Now researchers have found a host of compounds in the pumpkin that actually heal! Two in particular, trigonelline and nicotinic acid, improve insulin and glucose levels in diabetics. Plus a rich content of antioxidants known as polyphenols help shield the skin and eyes from harmful UV rays thus defending against skin wrinkles and macular degeneration, and slowing the development of Alzheimer’s. And that’s not all! Pumpkins are full of vitamins, minerals, calcium and fiber. They’re low in calories with no saturated fats or cholesterol. The fiber in pumpkin helps create a sense of fullness which aids in weight loss efforts. The seeds are rich in zinc. 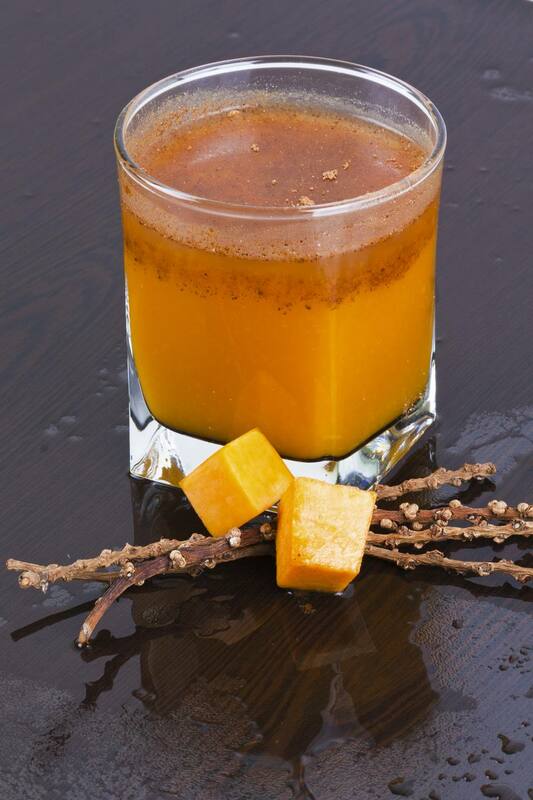 But most importantly, this pumpkin juice recipe is scary delicious! Even your kids will love it! Oh, and one more surprise! Pumpkin is actually a berry! No need for any added sweeteners! Pumpkin (and the apples) provide some natural sweetness to make this juice recipe one of the most delicious you’ll ever taste! First wash the outside of the pumpkin because we’re going to use it! That’s right, juicing the skin of the pumpkin is as important as juicing the meat, because the skin is nutrient rich. Same for the apple. Now cut your pumpkin into chunks and drop them raw right into your juicer or smoothie machine. By the way, the ginger, clove and cinnamon are also packed with newly discovered healing properties so drink up - it's tasty AND healthy!